The #1 bestselling chapter book series of all time celebrates 25 years with new covers and a new, easy-to-use numbering system! Jack and Annie's friend, Morgan le Fay, is in trouble! They must find four "M" things to free her from a spell. Their adventures take them to meet a ninja master in ancient Japan, flee a crocodile on the Amazon River, discover the cave people of the Ice Age, and blast off to the moon in the future. It's a difficult and dangerous mission, but Jack and Annie will do anything to save a friend! 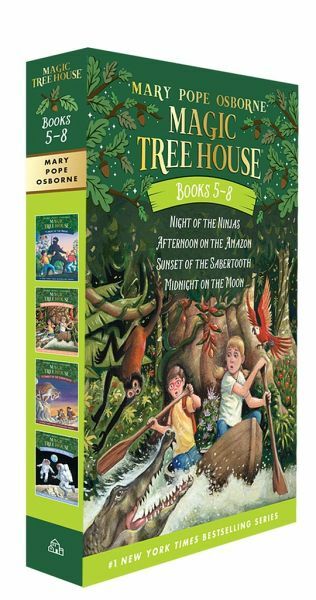 Books in this set include: Night of the Ninjas (#5), Afternoon on the Amazon (#6), Sunset of the Sabertooth (#7), and Midnight on the Moon (#8) Did you know that there's a Magic Tree House book for every kid? Magic Tree House: Adventures with Jack and Annie, perfect for readers who are just beginning chapter books Merlin Missions: More challenging adventures for the experienced reader Super Edition: A longer and more dangerous adventure Fact Trackers: Nonfiction companions to your favorite Magic Tree House adventures Have more fun with Jack and Annie at MagicTreeHouse.com!